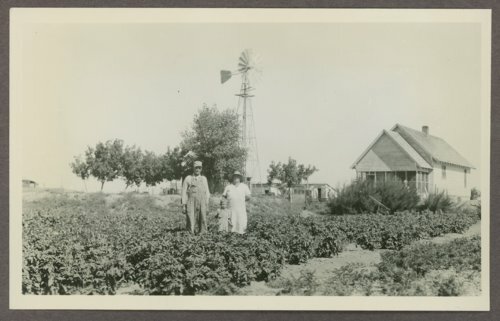 This is a photograph showing Grant N. Dunn's garden in Haskell County, Kansas. It was watered by a sub-irrigation system. Visible in the background is a house and windmill. The photograph was removed from the Relief Garden Program of 1935 portion of the Kansas Emergency Relief Committee collection.